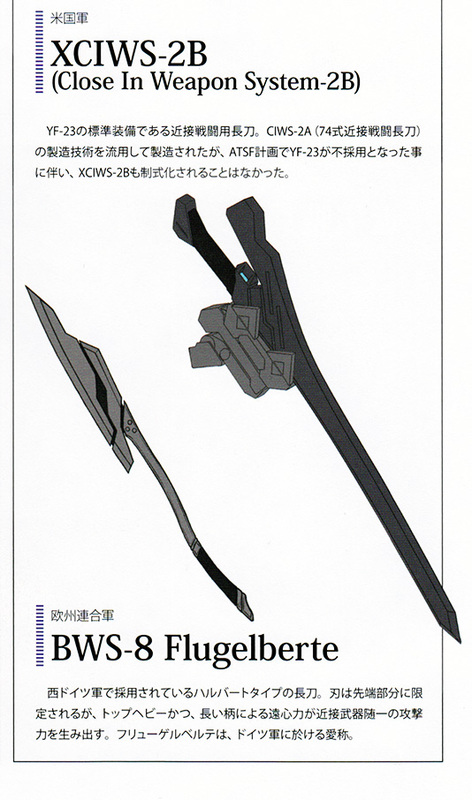 Recently I discussed a matter relating to translated terminology in Muv-Luv, mainly about if the term Melee halberd is valid when it comes to the weapons used by the TSFs. Let’s get the base out of the way first. In Japanese, the characters used for the combat weapons is 近接戦用長刀. A straight translation of this would be something along the lines of Naginata for Close Combat, which is weird as hell. The 長刀 causes problems and is read as naginata in Japanese, but when Japanese want to be fancy they often use the Chinese way of reading, sometimes using Chinese characters too. In Chinese 長刀 is read as changdao, a type of long sword, thus the correct reading would be Long Sword for Close Combat, or Close Combat Long Sword, whichever you prefer. 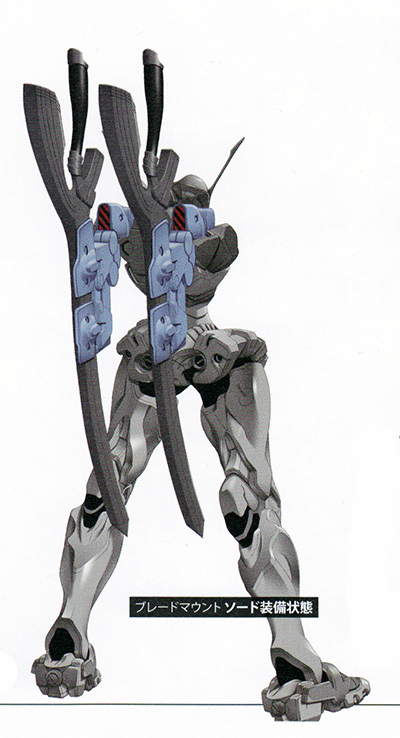 In Muv-Luv, the main sword the Japanese use invokes the type of sword a changdao is. Misnaming Close Combat Long Sword as Melee Halberd is sort of understandable, if you don’t check the Chinese meaning of the kanji. Even then, the Japanese naginata’s kanji is 薙刀. Whoever decided to call the swords are halberd was not on the ball. I’ve searched through some materials, and there really isn’t anything about Melee Halberds in plain old English as such. If I have missed an official translation for it, it wouldn’t ultimately bear much weight. âge’s English is less consistent that you’d want to believe, and the whole debacle about what to call Surface Pilots showed that some things are just thrown in to sound cool. Nevertheless, their Japanese naming for the close combat weapons are consistent across the board. The term Melee Halberd simply put it, a mistranslation and is something that should be fixed to represent the weapons better. Due to having an axe in the crowd, calling them swords outright would be a misnomer. In a recent discussion with Gabgrave of Alternative Projects, terms Close Combat Blade or Melee Combat Blade were pitched to replace the erroneous Melee Halberd. The cause is supported by the fact that, for example, Integral Works calls them as swords outright when discussing about Mounts. There is one item that is called a Halberd-type Close Combat Long Sword, and it is the BWS-8 Flugelberte in IW. Those who know your historical weapons well or were blade buffs as I was as a kid, you’d recognize that the BWS-8 does not fulfil requirements to be a halberd. A halberd is a two-handed pole weapon first of all, and the BWS-8 is intended to be wielded with one hand. Secondly, the BWS-8 is too short to be a polearm, mostly due to the aforementioned reason. Thirdly, any and all Close Combat weapons lack the necessary parts to be a halberd. It’s just a really slim battle-axe. A halberd has hree parts with its tip; the axe blade, a spike, a hammerhead or hook on the opposing side, and a spike of sorts at the tip, all attached to a 150-180cm pole. That’s five to six feet for you Americans. It’s an open question if Melee Halberd will be corrected in the Western release version. Seeing the translation work is being worked on without much breaks and carefully, I’m hopeful. I know certain part of the fandom is prefers the naming, but it really makes no damn sense to call swords and axes as halberds. Posted on 29/03/2016 29/03/2016 by aaltomiesPosted in âge, Muv-LuvTagged マブラヴ, マブラヴ オルタネイティヴ, âge, mecha, Melee halberd, muv luv, muv-luv alternative, Type-74 PB Blade. IMO either of the proposed replacements wouldn’t be that much better than ‘Melee Halberd’. Melee already implies fighting in close quarters, IIRC it also implies without the use of firearms. So ‘Melee Combat’ is redundant. Taking Combat out leaves us with ‘Melee Blade’. As far as I know, Bladed weapons are generally perceived as hand-to-hand combat weapons, super robot shenanigans aside, thus ‘Melee Blade’ is also kinda redundant. Of course exceptions exist, but since they are exceptions we have special terms for those, like Throwing Knives or Javelins, instead of having special terms for the norm. It would be equivalent to calling a ranged weapon a ‘Ranged Gun’ or ‘Portable Firearm’. In this sense, ‘Close Combat Blade’ is also redundant. Simply ‘Melee Weapon’ or ‘Close Combat Weapon’ would make more sense because the word ‘weapon’ doesn’t carry any sense of range. It’s also super generic and can be used to describe all close combat weapons that TSFs use. While the two have repetition, either one is a better option than Melee Halberd as none of the weapons is a halberd. If they were just swords, Combat Sword would be enough for sure, but because we have Flugelberte in there, it needs to be bumped up a level to general bladed weapons. Throwing knifes are also counted as a bladed weapon. Much like halberds, spears would be pole weapons. Close Combat Weapon, Melee weapon etc. would carry the same core meaning, I admit that I personally tried to keep the flowery form of 近接戦用長刀/Long swords for close combat in there rather than localise it too much. This is something to consider nevertheless, something to keep polishing on. But calling swords as halberds is just goddamn dumb and Engrish ain’t good enough excuse here. It’s true that they are both better than Melee Halberd haha I can’t disagree with that. I’m just not a fan of redundant naming conventions when they can easily be avoided. Close in Weapon System is actually quite close I think and it sounds cool as well, but that’s already taken by the Americans. The problem seems to be with the japanese term though. Long Sword doesn’t make much sense with the Flugelberte and the Falcate (lets not forget about that abomination…). Although, I guess Long Sword made sense at first because the Type-74 was the first large melee weapon and the Flugelberte and Falcate were only officially introduced much later. Perhaps it’s better to call each of them what they actually are (long sword, battle axe, sword-scythe-abomination etc.) and have the cover term be something simple like Melee Weapon. Adding to that, the header at the top of IW page 98 is 近接格闘戦用兵器 which doesn’t imply any specific type of melee weapon (as far as I can tell anyway). It’s actually a bit strange that they still refer to the Flugelberte as a type of long sword/長刀 when the header term seems to be much more generic. 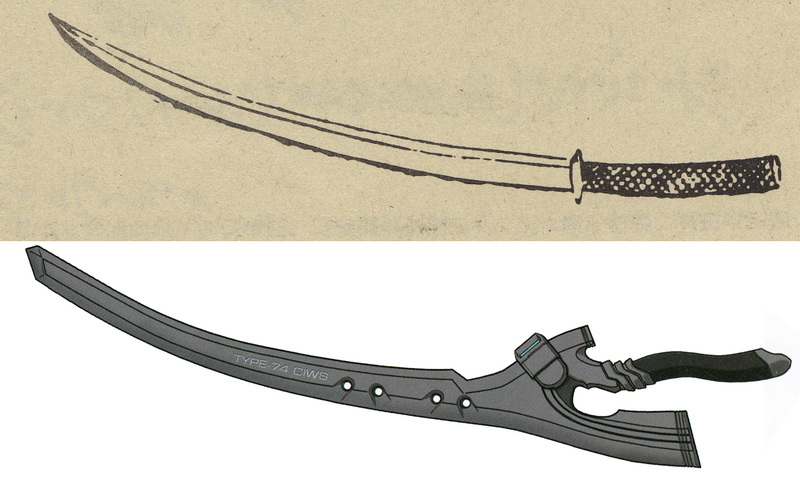 The Flugelberte also doesn’t look anything like a long sword/長刀. Close In Weapon System, while sounding a bit Engrish-y to me ear, might work if it was changed into Close Range Weapon System. The problem indeed is the use of changdao and its global application, but that’s something that can’t be helped in Japanese. Falcate actually has some sense into it, but maybe I’ll leave that for later. I have an idea to go through these Combat Arms (another possible choice) at one point and see if they have their points. BWS-3 at the very bottom of my personal list. Calling them what they are is without a doubt the best choice, and p.98 really does call them as, loosely TL’d, Melee Weapons for Close Combat. With Flugelberte, it’s weird to call a battle-axe a halbert type long sword, but that’s one of the points where âge wanted something cool sounding rather than something that would actually work. Yeah I’ve also always thought that Close In Weapon System sounds Engrish-y but it’s actually an real a term for point defense systems, as you probably know. Actually, now I wonder what does are called in MLA universe, or perhaps it just wasn’t developed. Oh I’ll look forward to your thoughts on the weapons then. I could never wrap my head around the Falcate and the BWS-3 only made slightly more sense to me. Probably also because I just haven’t seen them in action and can’t quite picture how they might be more useful than the long swords. Anyway, I hope a good solution can be found and it’s nice to know that the translation team is looking out for stuff that don’t make sense and are trying to fix them.